Atoms are the building blocks of matter. 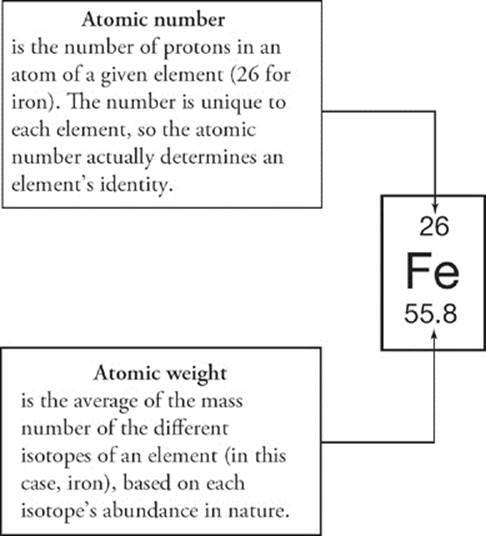 Understanding the structure of atoms and how atoms of different elements and isotopes differ from one another is critical to success on the SAT Chemistry Subject Test. Atoms and elements are the focus of this chapter. An element is any substance that cannot be broken down into a simpler substance by a chemical reaction. Now, what exactly is an atom? Suppose you have a spoonful of some element—;carbon, for instance. The smallest, tiniest, teeniest “piece” of carbon in the spoonful is one atom of carbon. Technically, an atom is the smallest particle of an element that still retains the chemical properties of that element. At the center of every atom is a nucleus. What makes up the nucleus of an atom? Two things: protons and neutrons. Protons have a charge of +1, and neutrons have no charge at all—;they are neutral. Because protons and neutrons comprise the nucleus of an atom, they are sometimes referred to as nucleons. What's outside the nucleus? Electrons; electrons have a charge of –1. 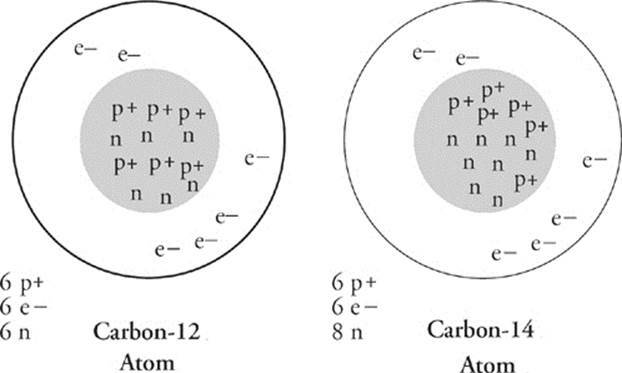 In an electronically neutral atom, the number of electrons is equal to the number of protons; the charges inside and outside the nucleus are balanced. Sometimes it happens that an atom loses or gains one or more electrons. When that happens, the number of electrons outside the nucleus is not equal to the number of protons inside. The atom isn't electrically neutral anymore and has become an ion. If the atom loses one or more electrons, it has fewer negative charges than positive charges, so it is a positively charged ion, or cation. If the atom gains one or more electrons, it has more negative charges than positive charges. This is a negatively charged ion, or anion. 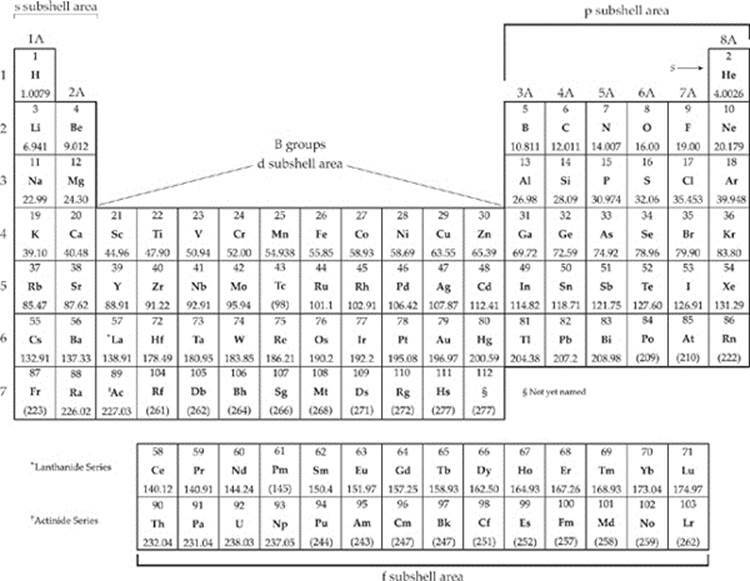 When you sit down to take the SAT Chemistry Subject Test, you will be provided with a periodic table. On the periodic table, the vertical columns are called groups, and the horizontal rows are called periods. The symbols (such as H, Li, Be, etc.) represent elements. For the SAT Chemistry Test, you have to know certain things about the elements and other information you see on the periodic table. Look at any element on the periodic table. Above every element's symbol is a whole number that represents the element's atomic number. The atomic number of an element tells you the number of protons in the nucleus of an atom of that element. The number of protons in the nucleus of an atom gives that atom its identity. Oxygen, for instance, has the atomic number 8; an atom of oxygen has 8 protons in its nucleus. If we take a proton away from an oxygen atom, it would have only 7 protons in its nucleus, and it wouldn't be oxygen anymore; it would be a nitrogen atom. Any atom with 7 protons in its nucleus is nitrogen. What if an oxygen atom loses an electron but not a proton? Well, as long as the atom has 8 protons in it, it's still oxygen. If it has only 7 electrons, then it's a positively charged oxygen ion, and if it has 9 electrons, then it's a negatively charged oxygen ion. But as long as the atomic number—;the number of protons in the nucleus—;doesn't change, the element doesn't change either: It's still oxygen. The group number refers to the number above each column of the periodic table, such as IA, II, IV, etc. Elements in the same group have the same number of electrons in their outer shells and share many properties. Carbon (C), Silicon (Si), and Germanium (Ge), for example, are all in the group IVA and have similar chemical properties. We said before that the nucleus of an atom is made up of two types of subatomic particles: protons and neutrons. Protons have a positive charge, and neutrons are neutral. Another important point is that both protons and neutrons have mass, while electrons have practically no mass. Protons and neutrons each have mass of roughly 1 atomic mass unit (amu), and an atom's mass number is equal to the sum of its protons and its neutrons. Now, we've said that in an electronically neutral atom, the number of protons is equal to the number of electrons. But this says nothing about neutrons. Most carbon atoms, for instance, have 6 neutrons in their nuclei. A few have 8. All have 6 protons in their nuclei, so they all have the atomic number 6, and they're all carbon. But they can differ in the number of neutrons. If two atoms of the same element differ in the number of neutrons in their nuclei, they are said to be isotopes; a carbon atom that has 6 neutrons and a carbon atom that has 8 neutrons are isotopes. Since an atom's mass number is equal to the sum of its protons and its neutrons, two different isotopes of the same element will have different mass numbers. For instance, the carbon atom that has 6 neutrons in its nucleus has a mass number of 6 protons + 6 neutrons = 12 amu. And, because its mass number is 12, we call it carbon-12. The carbon atom that has 8 neutrons in its nucleus has a mass number of 6 protons + 8 neutrons = 14 amu. And, because its mass number is 14, we call it carbon-14. By the way, mass number doesn't appear on the periodic table. Why not? Because for any element, there's no such thing as one mass number. As we've just learned, different isotopes of the same element have different mass numbers. However, chemists have figured out, roughly, the degree to which each isotope of each element tends to occur on Earth. So, for each element, they've figured out an average mass number, which for each element represents the average of the mass numbers of all isotopes as they occur on Earth. This average number is called the atomic weight of the element. The atomic weight of each element appears on the periodic table, just below the element's symbol. When we want to know the mass of an atom of a particular element, for practical purposes, we use the atomic weight that appears on the periodic table. Now try the following questions. The answers can be found in Part III. Questions 4–8 refer to the following. 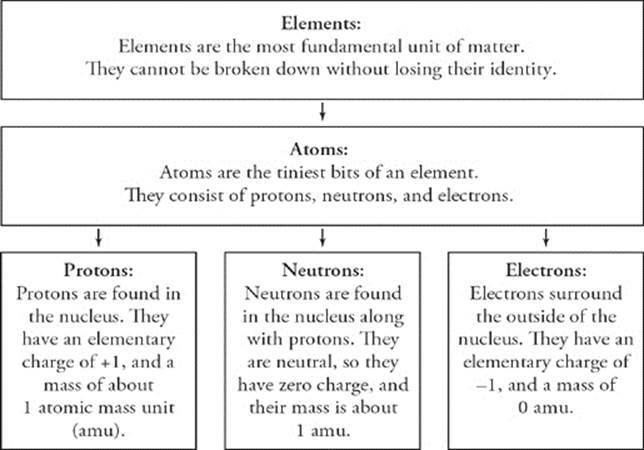 · An atom consists of neutrons (charge = 0, mass = 1 amu) and protons (charge = +1, mass = 1 amu) in a nucleus orbited by electrons (charge = –1, mass = 0 amu). · Atomic number is the number of protons in an atom of an element, and it defines the element. · Mass number is the number of protons plus the number of neutrons in an atom. · Isotopes are atoms of the same element that contain different numbers of neutrons. · Atomic weight is the average of the masses of the different isotopes based on the frequency with which they occur in nature.